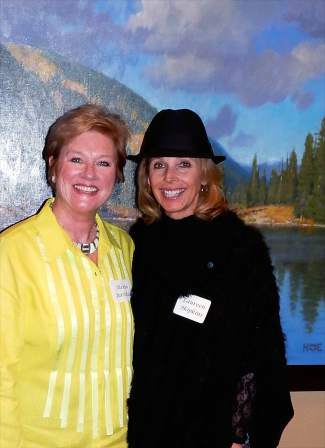 Hard-working VPAC Guild 2016 event chairperson Alexia Jurschak and the delightful Laureen Hopkins helped create a warm and wonderful evening of local tastings, camaraderie and community at the Beaver Creek Club. On the brisk winter evening of Jan. 28 at the Beaver Creek Club, the Vilar Performing Arts Center Guild held its annual A Feast for the Arts event, featuring gourmet tastings from area restaurants. There was an outpouring of gratitude to the talented chefs who gave of their time and talent to support the Vilar Performing Arts Center Guild. A strong representation came from restaurants in Beaver Creek, including Beano’s Cabin, Beaver Creek Chophouse, The Golden Eagle Restaurant, Grouse Mountain Grill, SaddleRidge, Splendido, The Metropolitan, Blue Moose Pizza and Toscanini. The Guild provides a critical link between the Vilar Performing Arts Center and our community. The mission of the Guild is to reach out to the entire Vail Valley and build awareness, accessibility and audience. The Guild fulfills that mission through community outreach, fundraising, events and performance underwriting. Through its outreach efforts, the Guild has provided tickets to local students, educators and senior citizens; books and tickets to children through partnerships with The Literacy Project, The Magic Bus and the Buddies Program; scholarships for students at the Vail Performing Arts Academy and Vail Valley Academy of Dance; and significant underwriting for Vilar Performing Arts Center performances. Guild members are active in creating special events to cultivate understanding and interest in the arts, as well as raising funds to support and increase outreach and underwriting. In 2015, the Guild provided partial scholarships for local students to attend Vail Performing Arts Academy’s summer theater camp and Vail Valley Academy of Dance summer classes, culminating in performances on the Vilar Performing Arts Center’s stage. The Guild provided partial scholarships for the Vail Valley Dance Intensive, Aspen Theatre Workshop, Studio 8100 dance camp and for voice lessons. The Guild also hosts an annual membership reception each summer and winter. With no paid staff, revenues support underwriting of Vilar Performing Arts Center programs and community outreach. During A Feast for the Arts, event chairwoman Alexia Jurschak greeted the crowd and made announcements regarding the successes of the Guild and its continued commitment to partnering with the community and making the arts accessible to a wide audience. Her warm reception and heartfelt connection to the cause and her community were apparent. She thanked all of the chefs, including Vail Catering Concepts, vin48, Vista, Maya and Zino. This truly was a communitywide event to support the Guild. Thanks, too, went out to Alpine Party Rentals. For more information about becoming a member of the Vilar Performing Arts Center Guild, contact Gary Wicklund at 319-631-3361 or visit http://www.vvf.org. Be sure to visit the site to learn about the Vilar Performing Arts Center programs and performances on the winter calendar. Betty Ann Woodland is a longtime local who covers social events including fundraisers for nonprofits, local happenings and soirees of all kinds. She can be reached at highaltitudesociety@vaildaily.com.